My first grand adventure in London wasn’t even in London. 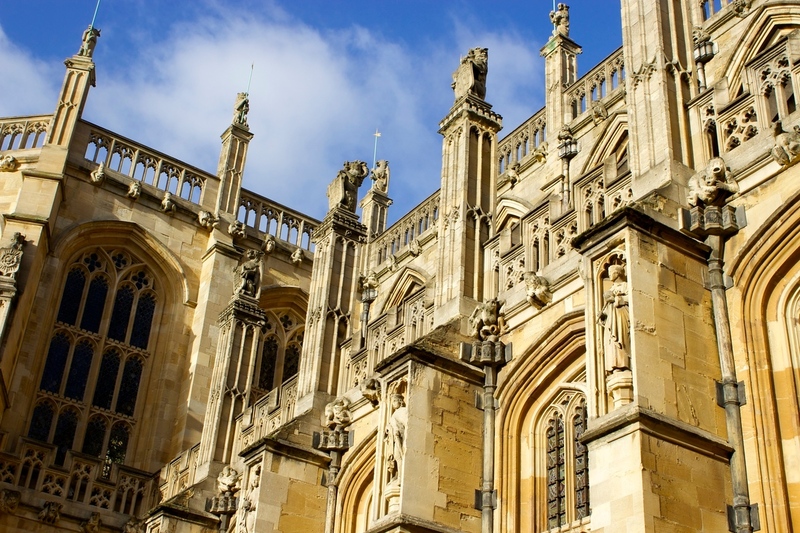 Instead, I visited Windsor Castle, Stonehenge, and Bath with Golden Tours. I found it slightly difficult to arrive at the coach station since I had practically zero previous experience in the city. Nonetheless, Londoners proved to be helpful as they pointed me in the correct direction. Today would be a good day. Our bus promptly departed London. Tish, our excited tour guide from Northern Ireland, led the way with her yellow, smiling sun umbrella. She pointed out rarer London sites on our way out of the city, such as a school choir in red robes making their way to a Scottish Presbertarian Church and homes which were previously stables. About 45 minutes after leaving London, we arrived in Windsor. It seems like a simple, yet pleasant, town. There’s a train station, shopping, and quaint town homes flats. 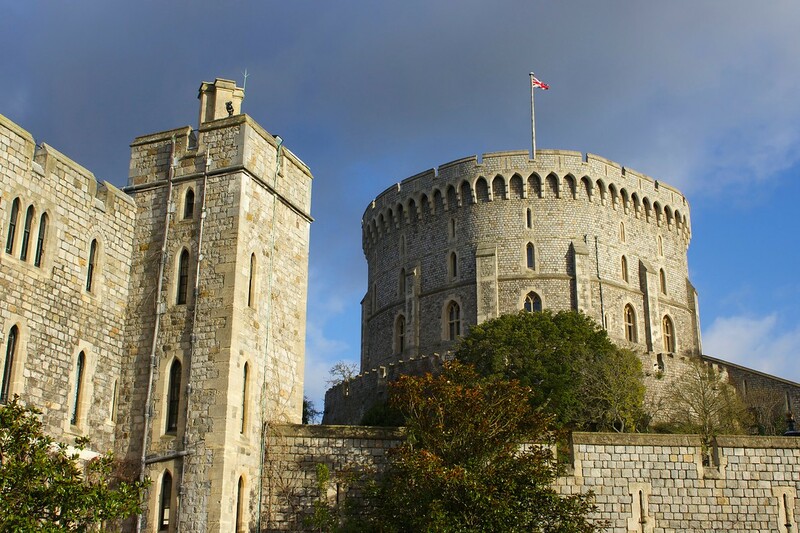 The group walked a few minutes to Windsor Castle, passing the train station and shopping on the way. 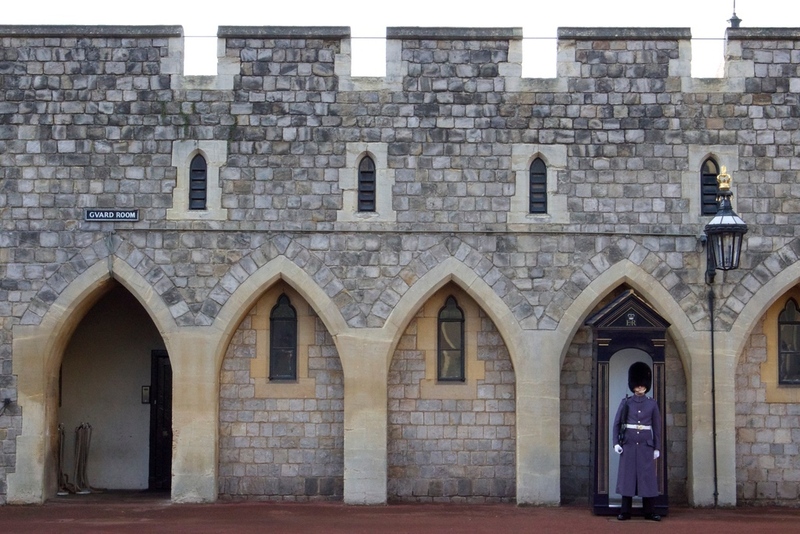 Inside Windsor Castle, I explored the Doll’s House and St. George’s Cathedral. Unfortunately the State Apartments were closed for maintenance, which apparently occurs every winter season. 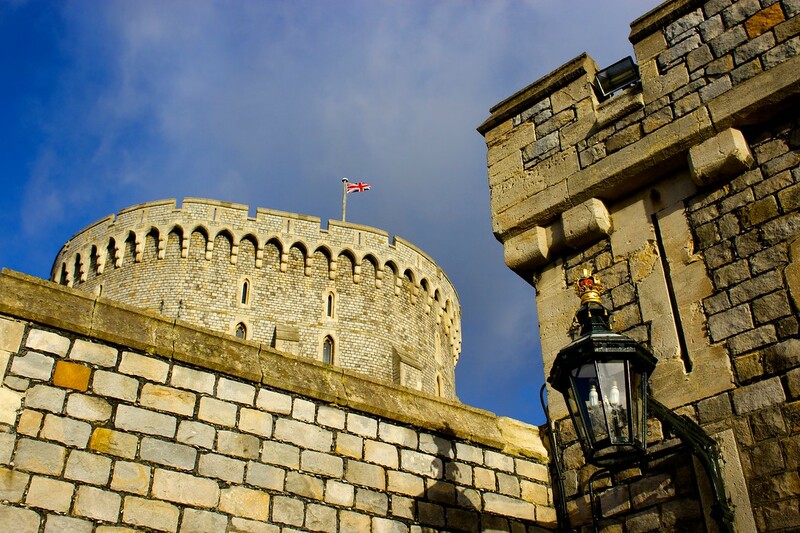 Windsor Castle, the largest inhabited castle in the world, is most commonly known as the Queen’s favorite residence. She celebrates Easter and Ascot week at Windsor and also visits for as many weekends as possible. Although unrelated to Windsor, I learned Queen Elizabeth takes a three-month vacation at a castle in Scotland for the winter holidays. The castle, over 900 years old castle, consists of not one building, but several apartments large enough to fit 268 tennis courts. A fire, started from mishandled electrical work, destroyed hundreds of rooms and nine apartments in 1992. 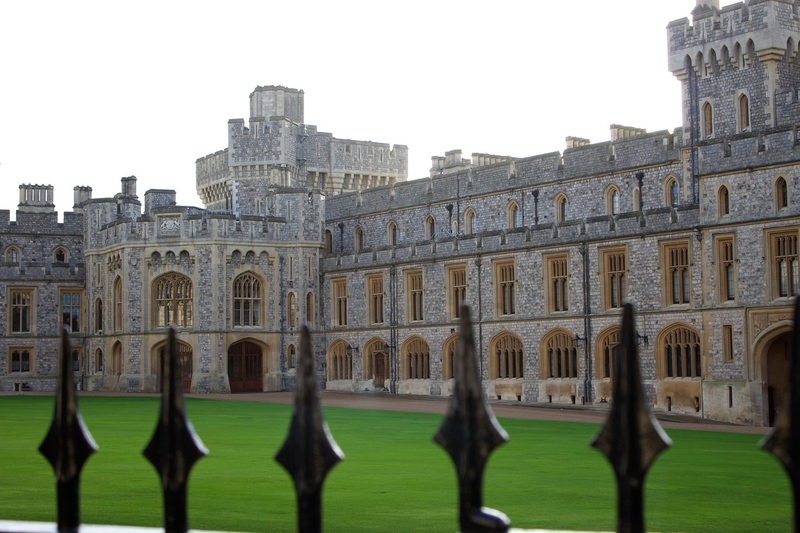 All the rooms and apartments are since restored, at the high cost of 37.5 million pounds. Despite the temporary closing of the State Apartments, the Doll’s House and attached China Room were still open. Neither exhibition really grabbed my attention, however the story behind the Doll’s House is interesting. It was a gift to Queen Mary, who liked to collect miniature items. Famous artists, designers, authors, and craftsmen contributed to the collection, which is on a scale of 1:12. The Doll House even features electricity, running water, and flushable toilets. No pictures were allowed within the Doll’s House and the China Room, but I did get a photo looking through a window into the State Apartments. Then I learned no photos are allowed inside at all. Oops…well, since I already took it, here is that photo. My favorite part of Windsor Castle was not the castle, but St. George’s Cathedral at Windsor Castle. I’ve visited several Gothic-style European churches, but for some reason St. George’s still captivated me. Unfortunately, photography was not allowed inside (again). The gorgeous stain glass featured many ordained priests. It was colorful and cheerful, a feature not common amongst Gothic architecture. The stain glass carried my eye to the Nave’s (congregation area) drastically high ceiling, which was hard to move past. It looked like pipes were growing from the ground. They hugged the columns, eventually spilling onto the ceiling. 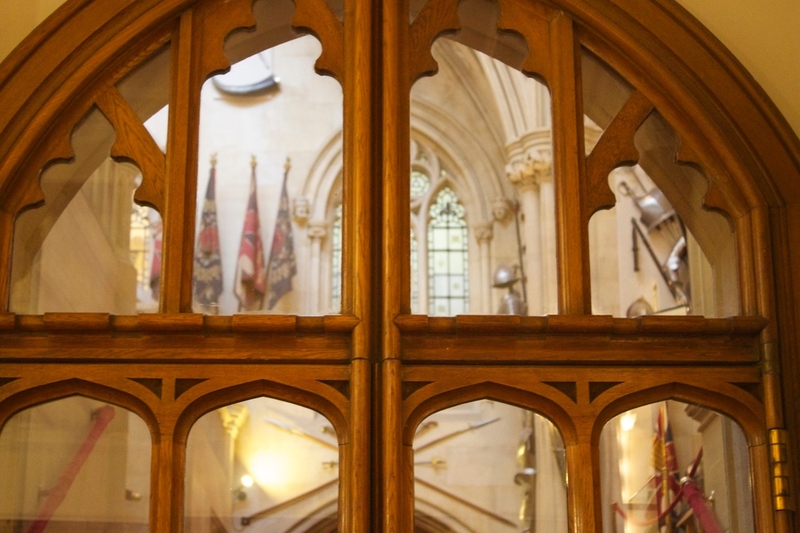 At the end of each pipe was a family crescent, arms of the garter, or religiously significant symbol. There are 275 in total. In the middle of the ceiling, four leaf clover moldings surrounded moldings of stars. Around the top of the Nave, by the windows, are 250 small angels. Each angel shows only the waist up, as if the angel was peering over a balcony. Moving on to the actual balcony, stationed behind the pulpit, a dominating black organ with vines growing up the gold pipes hides. St. George’s Cathedral is breathtaking, something I can’t say about the many other Gothic-style churches I’ve visited. The one bummer? Metal seats. That’s right, attendees to the daily service sit in cheap, foldable metal seats. Perhaps the designers ran out of money? At 11:00 I watched the highly-anticipated and ceremonial Changing of the Guards. I thought of it as long, drawn out, and boring. Already rushed for time, I would’ve rather stayed at one of the other sites longer than hurry to get a good viewing spot. I left early, at about ten minutes in, and walked back to the bus having used a good portion of time waiting and viewing the guards. Next time I’ll skip the Changing of the Guards and spend more time exploring the castle’s grounds. After an approximately one hour bus ride, the group arrived at Stonehenge. 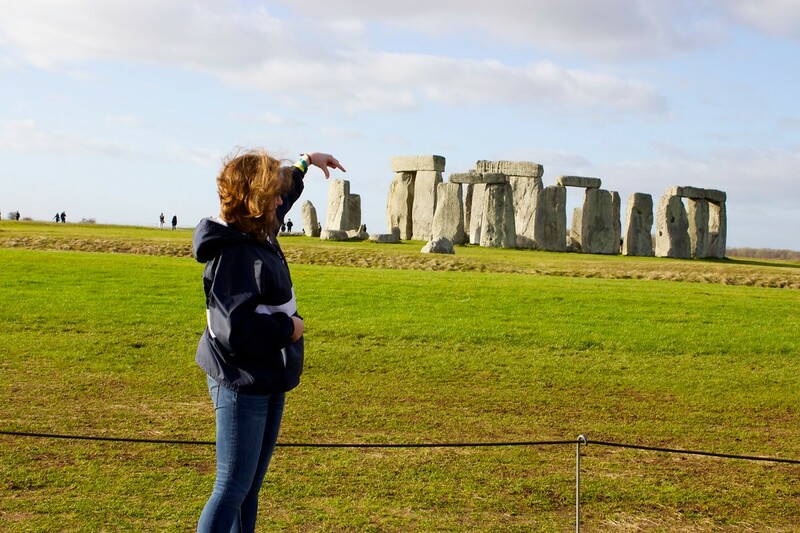 Apparently there are two types of people — those who walk away amazed by Stonehenge and those questioning why they spent money to view a bunch of rocks. Considering Stonehenge was what I was most looking forward to on this day tour, I fit in the former category. If you’re not interested in a bunch of rocks, but still feel the need to see them, you can clearly see Stonehenge from the car driving on the road to get there. It is a busy road with no side lanes, so you’d have to view it while driving past. As I said, I was most looking forward to Stonehenge, but I walked away feeling unfulfilled. My already high expectations upon arrival probably set me up for disappointment. 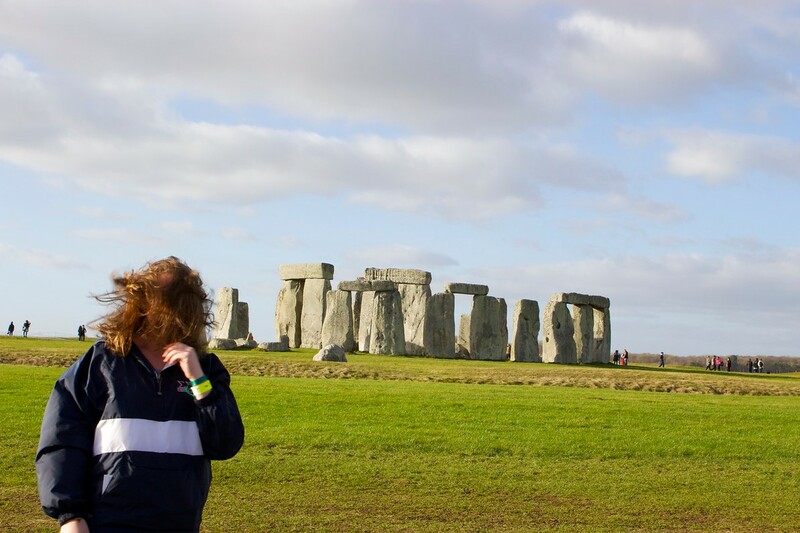 I had several ideas of the perfect photos of me with Stonehenge, but after asking three people to take a picture of me, I gave up. I even pre-set the camera settings, instructed how to take the picture, how to check if the photo is blurry, and described how to place me against Stonehenge. No luck. Perhaps I was disappointed because I spent the whole time taking photos instead of appreciating the mystery behind Stonehenge. I planned on simply enjoying the view at the end, but once I reached that point I noticed I couldn’t spot any more members of the tour group. I forgot the meet up time and rushed back to the bus, believing it already left. Turns out I still had 30 minutes to view Stonehenge. Perhaps the strong wind, and wind chill, made the experience less pleasant. The land around Stonehenge is relatively flat, thus making any wind 10x stronger. Despite all this, Stonehenge is fascinating due to its surrounding mystery. It is the longest-surviving, man-made structure…yet no one knows what its purpose was. 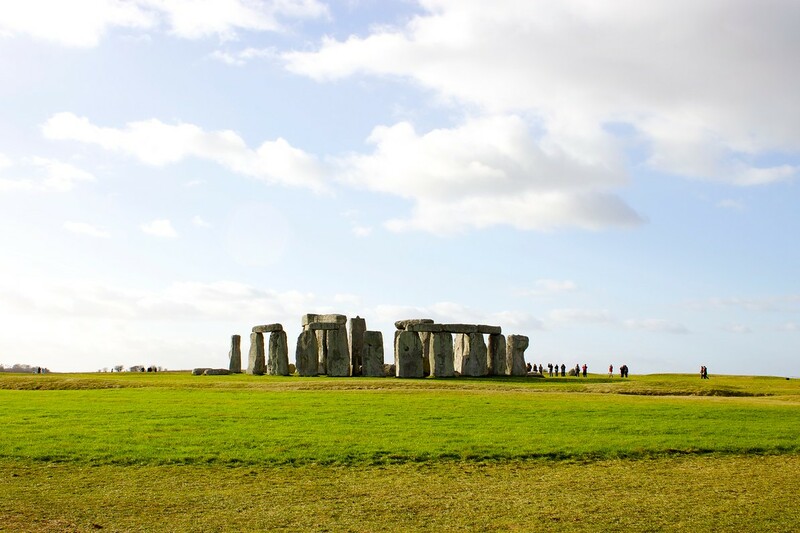 The site first saw use around 3000BC, but Stonehenge wasn’t built until around 2500BC. Some researchers argue Stonehenge was a sacrificial site because arrows buried in bones were discovered. Others argue it acted as a healing site. These stones, each weighing several tons, were somehow transported several hundred miles to its current location. For many centuries, people would travel far and wide to find herbal medicine or healing sites. Why else would the builders of Stonehenge transport these stones, each weighing several tons, such great distances? Stonehenge was certainly a holy place and a burial site. 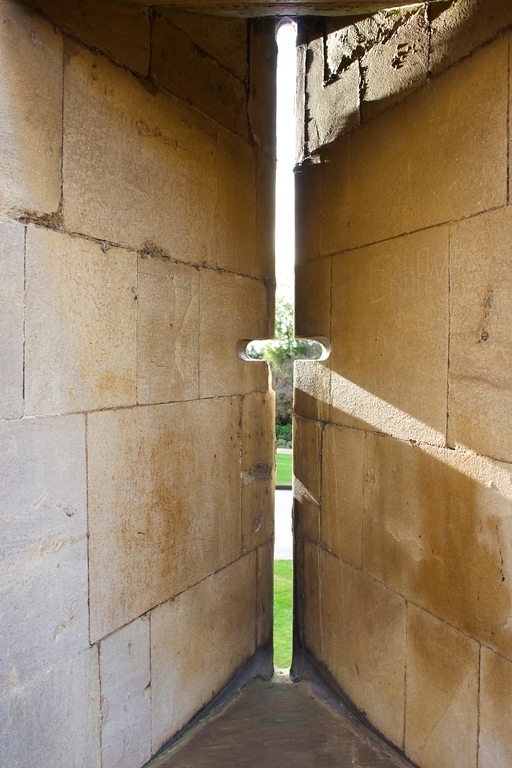 It also acts as a calendar, perfectly lining up with summer solstice allowing sun rays to penetrate all five archways. 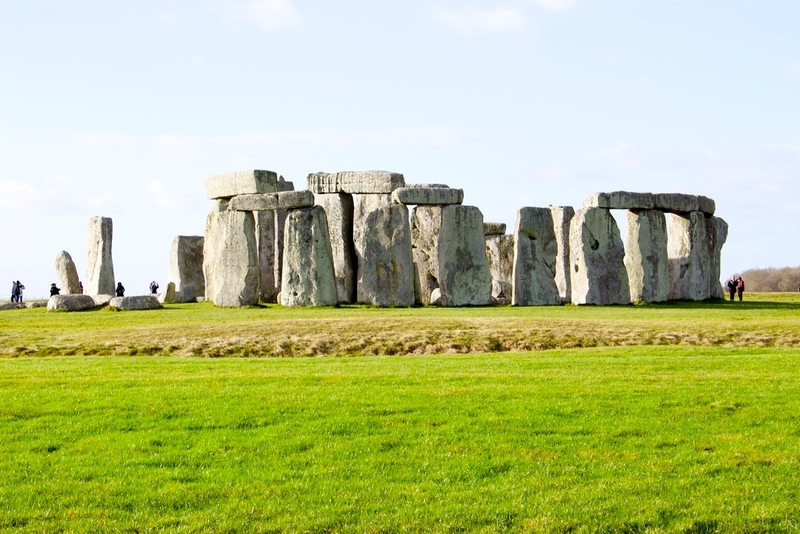 No one knows who built Stonehenge, but researchers call them the Beakers. Some Beakers are buried near the Stonehenge. They were buried with items, suggesting the Beaker people believed in an afterlife. Other mysteries include: Did people migrate here for religious purposes? Why this spot? Do the sheep know something we don’t? 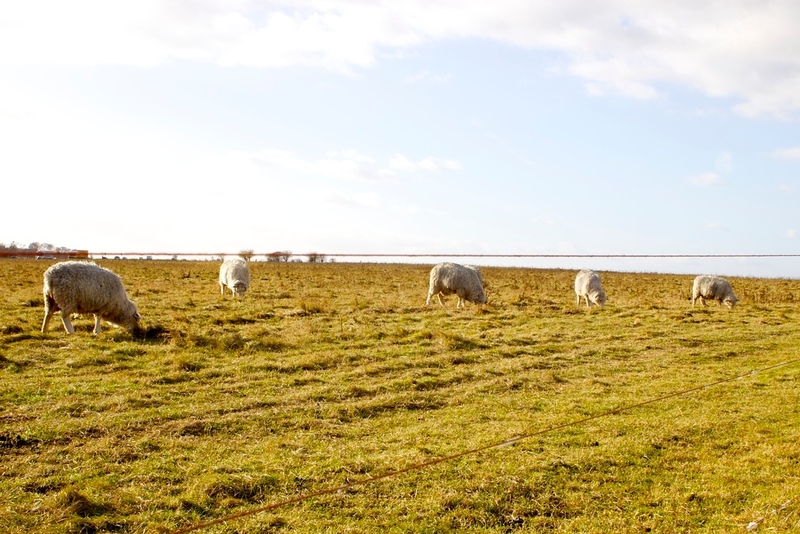 Side note: Known for its pigs, Wiltshire promotes free range and organic products. Due to the surrounding farms and strong wind, though, the smell of pig carried over to Stonehenge. A prince in line for the throne turned to pig farming due to leprosy. He brought his pigs to the water one day and had to entice them out with acorns. When they exited the water, the prince noticed all their warts disappeared. The prince bathed in the water and it cured his leprosy. He was welcomed back to the court and the baths were introduced to the Romans. The Romans loved the baths. They built underground heating and turned the bath into a temple dedicated to Minerva, the goddess of healing. But many years later, the Brits didn’t care for bathing and the temple fell into disrepair. The roof caved in and people even built over the baths. 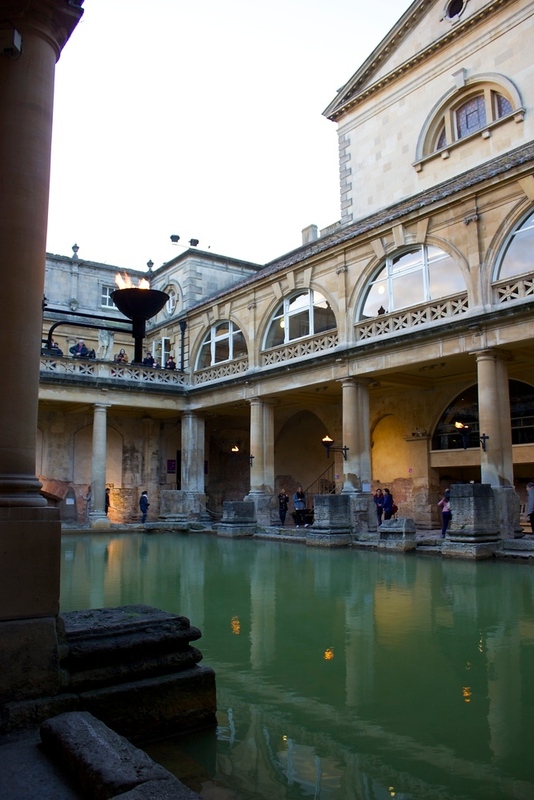 When King William conquered Britain, the Roman Baths were put back on the map. The royal family visited for decades, believing it improved their health and fertility. The baths are no longer open for swimming because they are heavily polluted from suffering years of disrepair, but a new spa facility is located nearby. There is also a tasting of the original (unpolluted) sourced water at the end of the tour. Some people love it, and others (like me) hate it. The water is warm and has a strong taste of minerals. 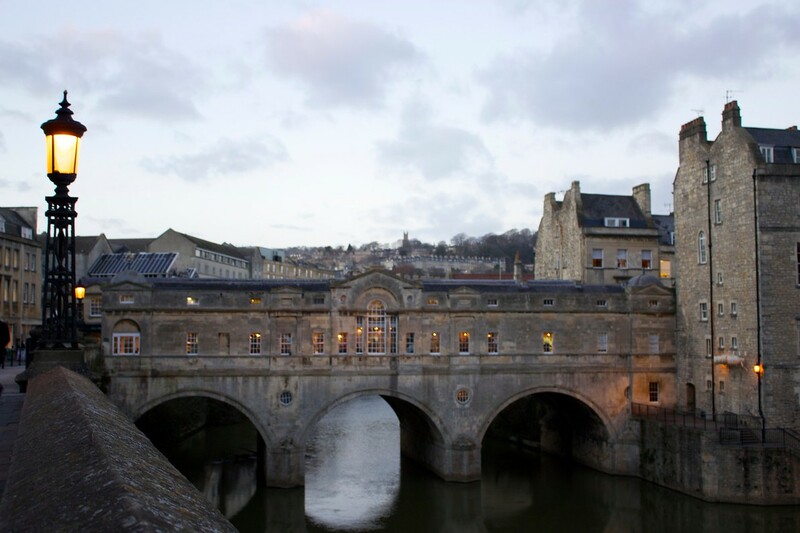 I sped through the baths self-tour in order to walk around the city of Bath, but a few facts really stood out during the tour. 1/4 million gallons of water are produced naturally daily. That’s enough to fill a bathtub in only 30 seconds! 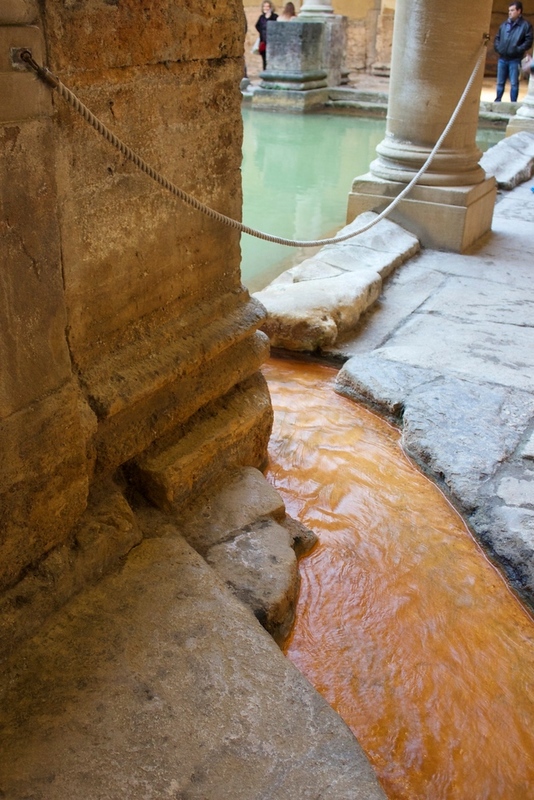 The Roman Bath is the only thermal hot spring in England. The water is constantly at a temperature of 46.5 degrees Celsius. If you’re looking for a quick snack while in Bath, stop at The Real Italian Ice Cream Co for amazing gelato. It’s right around the corner from the baths and tastes, as the name suggests, like real Italian gelato. 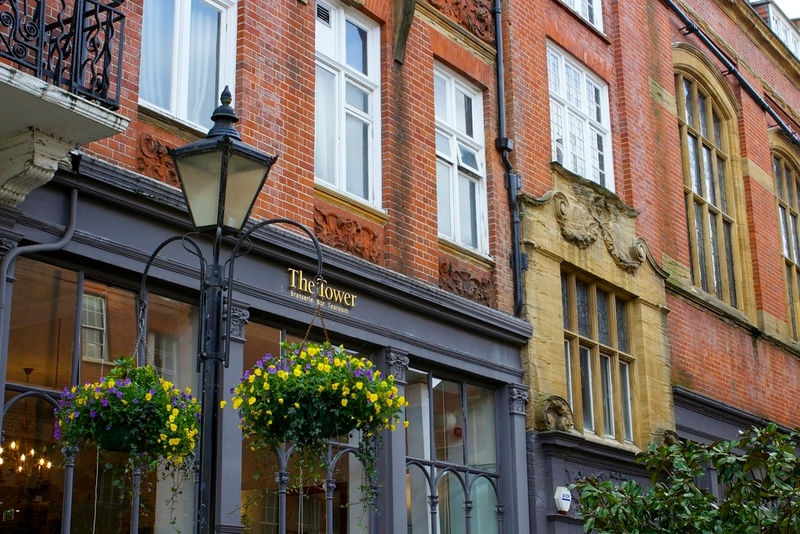 If you have time to spare during your bath’s tour, stroll around the lovely town at sunset. Tish filled the day with lots of advice and information. She explained the use of Roundhouses, which are small circular buildings where police locked misbehaviors up. Apparently, public indecency (aka, drunk) was the most prevalent crime. Tish pointed out thatch roofs, which has outrageously, and understandably, high insurance and upkeep costs. Tish also pointed out a white horse. No, this isn’t an actual white horse. Chalk is very common in Wiltshire. People used to carve horses, an ancient Catholic symbol for fertility, into the hills. There are seventeen in England, eleven of which are in Wiltshire. Tish was an absolutely amazing tour guide. I do not remember our bus driver’s name, but he smoothly navigated the crazy roads. No tour is perfect though. Golden Tours advertised free WiFi on their buses, which I assumed was unlimited. While making plans with a friend, I discovered a 20-minute WiFi limit. Trish lent me her phone, but it unfortunately had no signal. I eventually successfully met with my friend, but no thanks to Golden Tour’s WiFi. At 82.72GDP for a student fare, this taster tour was well worth it. We spent about 1.5 hours at each location. At first, I didn’t think this was enough time; 1.5 hours is not enough to see and do everything! But it is enough time to see the main sights, take several photos, and even listen to several segments of the provided audio tours. Does a day trip seem like enough for you? That is the perfect tour. 11/2 hours is just enough time to get a feel for the site and know if you want to spend more time there the next time you visit. Why don’t they let you take photos in some of those places? Did they sell postcards? Sometimes postcards have way better photos than I can take. Many places prohibit flash photography in order to protect the exhibitions. Flash messes with the chemicals in artwork, pottery, and other artifacts. I’m not sure otherwise, but it’s something to look into!